Arutz Sheva meets with IDF, US officers as two countries kick-off year's largest joint training exercise in Israel. American and Israeli forces launched operation “Juniper Cobra” this week, a two-week joint defense training exercise bringing together more than 4,500 service members from the IDF and the US military’s European Command (USEUCOM). Since 2001, Israeli and US security forces have conducted a total of eight Juniper Cobra joint combat exercises, including the most recent exercise in February 2016. This year, the US military has deployed over 2,500 service members, including 1,400 Marines and 1,100 naval personnel. In addition, 2,000 IDF soldiers are slated to take part in the exercise, making Juniper Cobra 2018 the largest joint combat exercise between Israel and the US this year. Two US Navy vessels have taken up positions off the coast of Israel and will be taking part in the exercise. On Tuesday, the USS Iwo Jima arrived off of Israel’s coast. On Thursady, the USS Mount Whitney docked at a Haifa port. 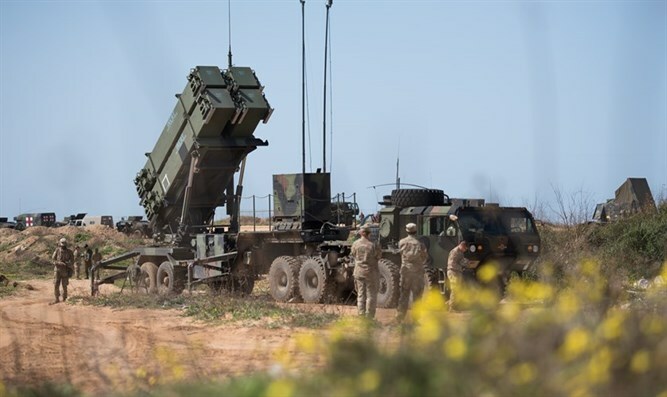 The ninth Juniper Cobra exercise will hone the ability of US and Israeli forces to coordinate their responses to complex threats, especially missile attacks from regional foes like Iran and Hezbollah. The exercise simulates scenarios in which US forces would deploy to Israel in order to aid the Israeli air force. The drill, Israel Air Force Captain Ron Shavit told Arutz Sheva, focuses on a "scenario in which missiles are launched at Israel. One of the [goals] of the drill is to cooperate together and improve our abilities and work together." Dozens of aircraft, missile defense systems, ground forces, and naval assets will be involved in the exercise as complex multi-front combat scenarios are simulated in real-time. "It is great to be here in Israel and it is great to stand shoulder-to-shoulder with our Israeli parties as we participate in Juniper Cobra '18," US Army Colonel David Shank told reporters. "This is a bilateral exercise, it is a ballistic missile exercise and it is an exercise that provides us the opportunity to continue to strengthen our partnership and deepen the cooperation that we have with our Israeli partners." Together, the participating units will perform computerized simulations of a variety of rocket threat scenarios in different regions. The simulations include the use of the "Arrow," "Iron Dome", "Patriot", and "David's Sling" Systems. The David's Sling system was declared operational in April 2017. "The ‘Juniper Cobra 2018’ exercise will serve as an opportunity for the IDF, and the IAF in particular, to enhance operational capabilities in the face of high-trajectory threats,” said Commander of the Aerial Defense Array, Brig. Gen. Zvika Haimovich. “The exercise demonstrates the strategic and fundamental cooperation between the IDF and the US Armed Forces. In the coming weeks we will train together to face complex and challenging scenarios, which are relevant to the dynamic range of threats that we must be prepared to face."